Conlin turns in his sleep, grasping his soother while Elliot lets out a little grunt. They are both sound asleep and Caden is in the awkward stage of feeling sluggish but not wanting to do anything about it. His mind is not on rest or quiet play, but instead on the snow outside. The snow which absolutely fascinates him. He runs to the window as it falls and begs to go out and build more snowmen then watches in dismay as the head of his previous snowman tumbles off from the warmth of the sun. More snow will fall I tell him, but we have to be patient. A hard thing for a boy his age. But he is satisfied to wait when I hand him the camera, show him how to peek through the top, and we head outside to tell the snow to ‘say cheese’. He would stay out all day if I let him but the babies are stirring and his little fingers are getting numb. Stolen moments with just him, so precious to me, feeding into his curiosity and creativity. I hold those so close to my heart. Bonus for me…might have a future photography buddy? or three! 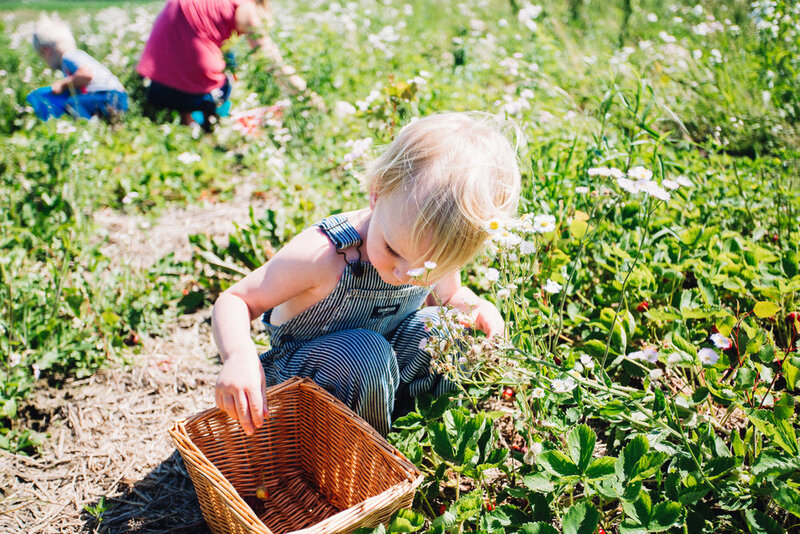 Nothing says summer like sunshine, strawberries, and best friends. Summer is drawing to a close and I am so happy to have been able to capture so many of my boys adventures. Most of the images of Conlin are the back of his head - he just likes to run, run, run and the more pregnant I get the harder it is to keep up! 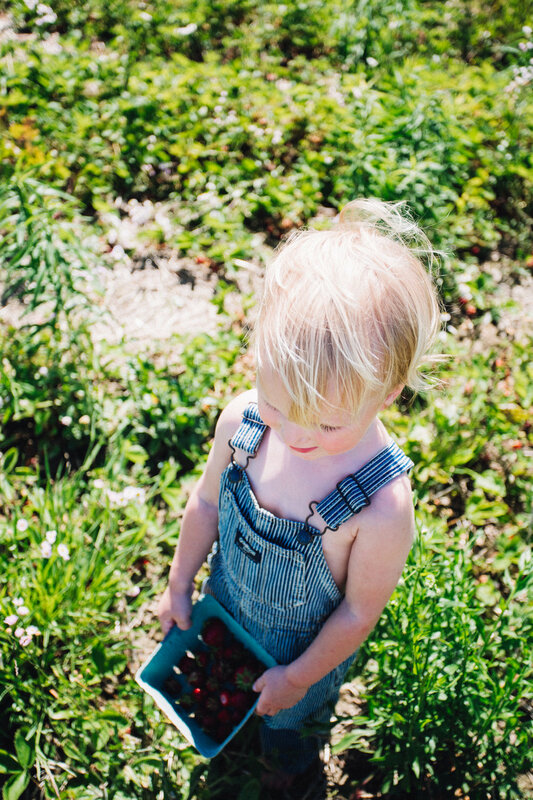 Conlin actually stayed put as the boys filled their buckets with bright red strawberries; devouring the strawberries we put into his little bucket. Pretty sure we should have weighed him on our way out! I love photographing children at play, I love being able to get down on their level, see the adventure from their perspective. I love being able to look back and see their smiles, the little messy hands, the tiny details. It will be so fun to look at these images as next summer approaches and we plan our adventures! I sometimes get asked what ‘lifestyle’ photography really is. To me, lifestyle photography is a perfect blend of documentary photography - or capturing life as it really is - and loose posing. For example: the image above is 100% documentary. Pantless, winter hat in the scorching heat, and a lollipop. That’s exactly how I found him and happened to grab my camera fast enough to capture this phase of toddler hood. However this image is more lifestyle: this is an everyday childhood moment that I wanted to portray. I found a perfect patch of light, set out an egg carton and some markers and invited him to come color. I stood out of the way and captured what I saw. I love capturing and documenting their childhood both ways! But honestly, I don’t always have my camera in arms reach so I like to recreate parts of their childhood. The vision: simply decide what you want to capture. Does it make you crack up every time your baby dumps oatmeal on his head? Or maybe it is the little lullabies your daughter sings to her dolls. Or the way they sit and race their dinky cars over the hardwood floors. Take a few minutes to think through what piece of their childhood you want to capture. Set the stage: find a nice spot in your home with even lighting. Pick up and move anything that might distract from what you are wanting to capture. Set up the props. Have your camera ready! Make sure there is room to take photos, adjust any settings, and have it ready to go. Invite your subject: invite your child into the little set up you have made. Don’t bribe them, or try and convince them they need to go over there, just nonchalantly invite them as if it isn’t a big deal, and it might just be a grand old time. Sit back, don’t say anything and capture what you see. This is where you really get those sweet emotions, the realness of the moment, and what I believe is the magic. Just let them be and when they are done, thank them for coming over and playing in that space. Remember to move around (as subtley as possible) and get several different angles - on their level, above them, off to the side. It makes a wonderful series of images. Staring out through the window at a colorless sky, dirty snow covering our fields, and no hope of sunshine to be seen I made myself a promise. This summer. This summer I would not complain it was too hot. This summer I would forget the annoyance of bug bites. This summer I would fully embrace outdoor adventure. I created a list of local conservation areas and firmly decided that I would visit them all. It’s late August and I feel like I have kept my promise. We haven’t quite explored them all, but that’s okay. It’s mostly because we have fallen in love with three or four of them and can’t keep away! Let me tell you the first time I took my boys on an adventure hike I wasn’t so sure. They weren’t either. I wore Conlin on my back and held Caden’s hand encouraging him forward. He was interested, but not overly. He wasn’t quite sure what to do and really just wanted me to pick him up and carry him the almost 2k hike. Pretty sure that first hike ended in tears. But now - he now races ahead, bucket for his treasures banging the side of his legs as he runs. He stops and digs in the dirt, he clambers onto fallen logs, he yanks off his clothes and splashes into shallow creeks. He loves being in the wild. I have learned to embrace the weather, embrace the bugs, embrace and rediscover the childlike joy of every new and almost familiar discoveries around each corner. Get outside! Grab a map and explore the many trails, little bridges, and wildlife of our Ontario conservation areas. 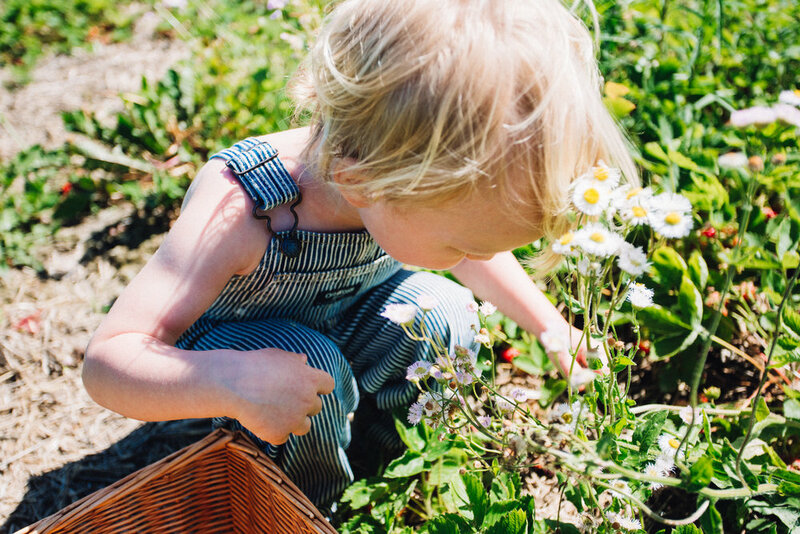 Let the little ones lead; take it at their pace. 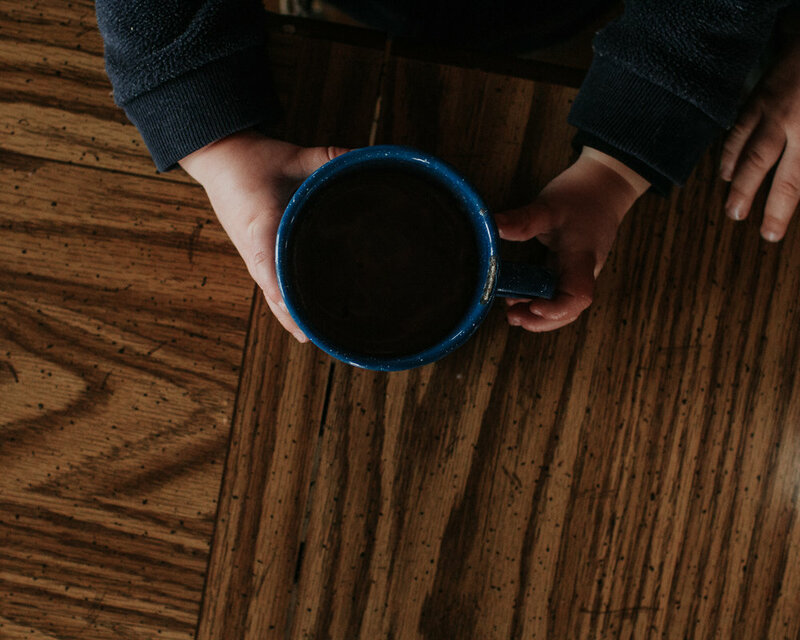 Bring snacks, a bucket for treasures, and a willingness to let go and just be. 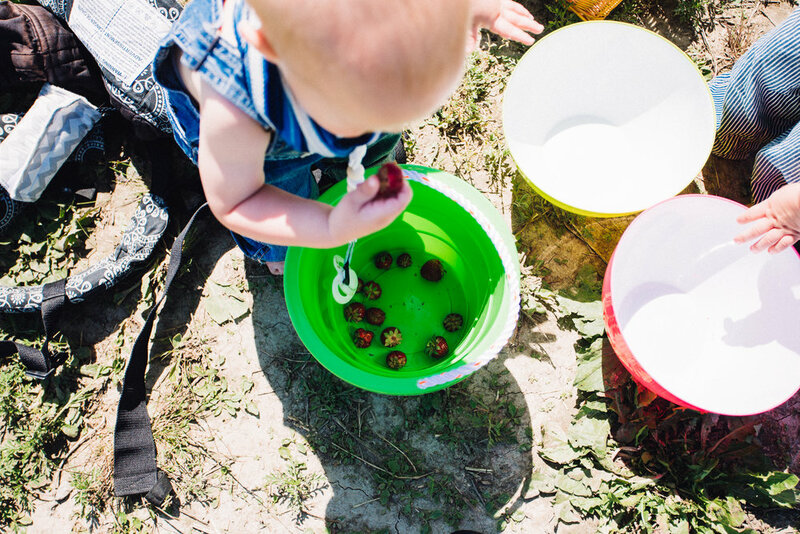 Don’t worry about muddy clothes, dirty hands, or bulging pockets (because the bucket is never enough). Embrace your surroundings. The more we go, the more we discover; and really, the more fun we have! Last time we went we were four hours before we emerged again, and they still weren’t ready to leave. (But mommy was. She ate all the snacks). There is so much magic to be had outside on an adventure hike. When my kids started to get more comfortable with the Quinte area wild I started to bring my camera and document their adventures. 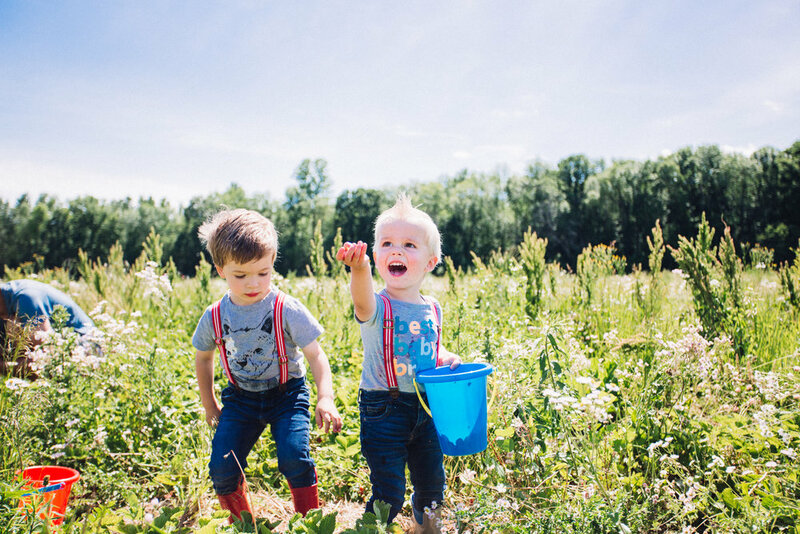 I love being able to bring my passion for lifestyle and family photography into the outdoors and capture the kids exploring their earth.